The Higgs boson-like particle has been turned into music. Not only is this a way to bridge the gap between science and the public, but it could enable researchers to hear their work in a new light. Image of the ATLAS experiment's preliminary data that was turned into a musical score by Vicinanza. The area marked in a red circle (notes 25-27, or 3.5 seconds into the music) is a Higgs particle. Top image, front page image, & below music tracks courtesy Domenico Vicinanza. With all the excitement about the new Higgs boson-like particle found by the Large Hadron Collider researchers this summer, few people realize the scale of the data management involved; some have even asked what relevance this discovery has for people outside of particle physics. Now, researchers have created an acoustic analogy for the public. Domenico Vicinanza, of DANTE, UK, who recently created music from positron particle tracks, worked with researchers, high-speed networks, sonification techniques, and grid computing to create two new musical tracks that directly come from experimental data of the new boson. This data was provided by the ATLAS experiment. There are two versions of the Higgs music: one played on a solo Bosendorfer piano, and the second played with added bass, percussion, marimba, and xylophone. This work can be seen as a bridge between physics research and the public. "This is an interesting and funny outreach exercise, I already pinned the score on the board in our corridor," said David Rousseau, a former ATLAS coordinator of offline software for data reconstruction, analysis, and simulation. "It is nice to add the musical angle which can draw the attention of people who have no prior interest in physics." According to Vicinanza, there is also a serious approach to this exercise. 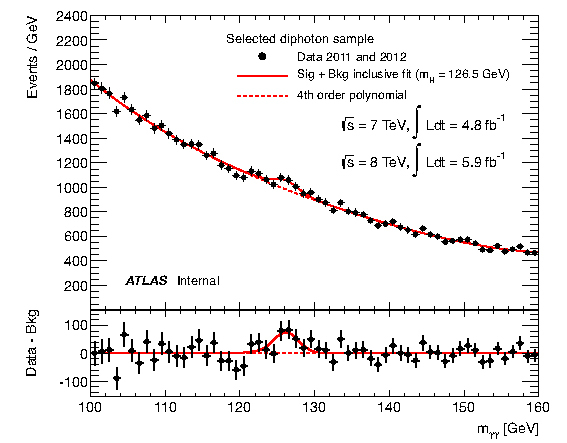 "The Higgs sonification is an alternative representation of the ATLAS experiment scientific graph presented on 4 July. Listening to the melody could allow a blind researcher to understand exactly where the Higgs boson peak is and how big the evidence is," said Vicinanza. "By studying different sonification algorithms, we can find more effective ways to support researchers to detect interesting phenomena by listening to them. Since sound is not directional, i.e. one does not need to stare at a monitor, or stay exactly in front of a screen, sonification can be used on the move." To create these melodies, Vicinanza worked with Mariapaola Sorrentino from the ASTRA project, UK, and Giuseppe La Rocca of INFN, Italy, to use the pan-European 10 gigabit-per-second GÉANT network and the European Grid Infrastructure (EGI). These infrastructures were also crucial in enabling researchers to find the new particle. Piano version of Higgs music. "The discovery of the Higgs-like particle required an enormous amount of computation: 150,000 processors have been running for just ATLAS continuously for the last few months," said Rousseau. Multi-instrument version of Higgs music. EGI works in collaboration with the WLCG, a computing grid with over 200,000 worldwide processors, that provide 24-hour and seven days-a-week access for researchers to computational resources. Another participating infrastructure is the Open Science Grid (OSG) in the US. These are needed for data analysis, sharing results, and extracting meaning from the data flood of 600 million particle collisions generated every second by the LHC. Applying a music analogy to the amount of data the LHC generates demonstrates the huge needle-in-a-field-of-haystacks challenge researchers' faced in finding the new boson. "If we could store all the music of data from the LHC for a year, we would have 600 million years to listen," said Sandrine Laplace, an ATLAS researcher based in the LPNHE laboratory in CNRS, Paris, to itechwhiz.com. "Materially, we could save 40 years of music by carefully selecting the pieces that we felt were most relevant. This is already a virtual stack of CDs of 20 kilometers [12.43 miles]. In this mass, the appearances of the Higgs boson are only a few scattered notes embedded in background noise. A few minutes of music at best." According to Laplace, this description is useful to teach the public about her research. "Talking about mega or petabytes is not meaningful for everybody, but talking about hours that you would spend listening to music is." Since making this comment, Laplace's research colleagues have told her how much they like her comparison.